Tungsten Carbide is 10 times harder than 18K Gold … 5 times harder than steel … and 4 times harder than Titanium. Tungsten measures between 8-9 on the Mohs Hardness Scale (Diamonds are a 10 - the highest on this Scale). Why is this important? Tungsten Carbide rings have been referred to as the ring with the “permanent shine”. They simply will not show wear like gold or silver where the original pattern and design disappears through the years. Tungsten Carbide rings tend to maintain a forever, shiny finish. Add to this the fact that they are virtually scratch-proof! In fact we have a ring pictured below that features a lifetime warranty that even covers scratches for as long as you own the ring - we have never seen a ring warranty so comprehensive. Ever. It is the J095C in classic style with a brushed finish and highly polished step-edges. All Triton branded rings made with patented TC.850 Tungsten Carbide pass a stringent assurance test with certified laboratories to ensure they are made with nickel-based binders and are cobalt-free. These certified laboratories test/assay for nickel release assuring the hypoallergenic properties of the material. Triton Tungsten Carbide products are also compliant with European standard EN1811:1999 for nickel release. Triton has been recognized with 7 patents for their extraordinary 30-step finishing process using only nickel-based binders and their proprietary Tungsten formula. Is it any wonder that Triton Tungsten Carbide rings come with a written Lifetime Warranty? Inferior Brands of Tungsten Carbide. Are there products on the market made from inferior brands of Tungsten? Unfortunately the answer is yes. Cobalt binder is far less expensive to use in the manufacturing process but is typically not disclosed by the manufacturer. The result – negative skin reactions and a far more brittle finished product. We advise you to stay away from these brands. Furthermore, if a manufacturer uses pure tungsten, instead of the patented blends used by Tayloright© and Triton, the hardness of the tungsten can be compromised resulting in scratches, mars and dents over time. Both the Tayloright© and Triton brands are hypoallergenic due to certified test results of final nickel content of under .500ppm (parts per million). If you still have additional questions regarding the tungsten carbide ring of your choice or even if you have selected a titanium or cobalt or ceramic ring - feel free to contact us at 801-755-1661. We answer our phones 6 days a week from 8 AM until 8 PM - we are open for business online on Sunday but this is one day we do not respond to emails or phone calls - we are with our families on this day. If you are choosing tungsten carbide it is probably because you have heard that it is a scratch-resistant substance and you might feel you are rather hard on jewelry! Join the club ... this material - tungsten carbide has become the hottest seller men's material for rings in the nation and is fast approaching the same popularity throughout the world! 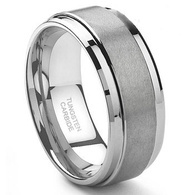 We regard tungsten carbide at mens wedding bands as the ring of the future in that it is virtually scratch resistant, has a dynamic, lustrous shine that is almost permanent, is priced right, and can be etched, or filled with gold inlay or even genuine stones such as firey diamonds! What more could you want? And now, Triton has added not just a white tungsten to their beautiful line of fashion jewelry but now black and just recently they have added the newest addition - white and black tungsten carbide rings in sizes from 4 all the way through 16 including half sizes! What more could you want? The one possible drawback - but one that bothers very few people - is the fact that a pure, genuine tungsten carbide ring is heavy. It is heavy on the finger - more so than platinum, or gold, or far more than titanium and even heavier than ceramic or stainless steel. Does this bother many people - a few say it is simply too heavy but the majority of men who wer tungsten say they choe it because it WAS heavy and WAS durable and WAS masculine and of course priced right also. Other drawbacks? Well, if you drop a tungsten varbide ring on a hard floor like harwood or tile the ring can shatter and if it does you can say goodbye to that ring forever. Fortunately most of the legitimate manufacturers of tungsten carbide - like Triton out of new York - offer lifetime warranties against this sort of thing so not to worry! But remember that it can happen and because it can happen a person should make sure that they have not ordered a ring that is too big for their finger because if it falls off on a hard surface with any kind of force you might be looking for a new ring. All in all - given the few drawbacks as compared to all of the positives - we feel that tungsten carbide is here to stay and will become the most fashionable ring to wear in the world because of the comments and observations aboce - not the least of which is that price is a factor and a good one! New styles are coming out each year as noted with black, white, and now black & white tungsten carbide rings. Look for new and dynamic styles coming out of Triton this Spring which hopefully will turn some heads as they did when they introduced their black diamond wedding bands in 2011.